The problem with developing a cult classic is that you develop that product out of a particular set of circumstances and point in your talent and creative life. These circumstances and critical life juncture cannot, and perhaps should not, ever be repeated, and yet the finicky public’s appetite for artistic stagnation is unyielding when something they like is placed on their all too picky plate. A high-class problem, to be sure, but one a singular artist like Bilal Sayeed Oliver (hereafter just known as Bilal, and not to be confused with indie soul artist Bilal Salaam) has been experiencing since his 2001 Interscope Records debut, 1st Born Second. The problem with developing a cult classic is that you develop that product out of a particular set of circumstances and point in your talent and creative life. These circumstances and critical life juncture cannot, and perhaps should not, ever be repeated, and yet the finicky public’s appetite for artistic stagnation is unyielding when something they like is placed on their all too picky plate. A high-class problem, to be sure, but one a singular artist like Bilal Sayeed Oliver (hereafter just known as Bilal, and not to be confused with indie soul artist Bilal Salaam) has been experiencing since his 2001 Interscope Records debut, 1st Born Second. With penultimate projects by Jill Scott, D’Angelo, Glenn Lewis and Erykah Badu appearing around the same time, Bilal’s debut almost seemed to be among the closing bookends of the all-too brief era coined “neo-soul.” Four albums and three labels later, fans at shows still clamor loudest over those songs from this J Dilla, Dr. Dre, and Soulquarians produced project, most especially the Top #20 R&B hit, “Soul Sista.” Only Bilal has long since musically progressed past his “neo-soul” beginnings - much to some of his starter fans' frustrations - to become one of the most original hybrid jazz/funk/rock/soul voices of his generation. 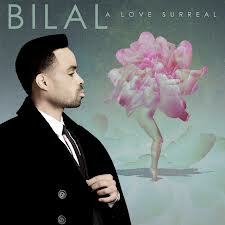 His latest, A Love Surreal, puts a firm stamp on the finality of Bilal’s defiant move forward. The question remains, will fans come along for this artist’s artist latest ride? It’s understandable why some fans struggle with change, particularly in Bilal’s case. Like the best jazz musicians, his greatness as a vocalist and musical innovator lies in the technical world of music more than its pop conventions. That's not surprising, given the Philly native’s jazz training at the famed New School for Jazz and Contemporary Music in New York, where he later taught. It takes an ear, either trained formally or through appreciation, to hear the genius in Bilal’s technique and broad scope. What Bilal is able to do live, the creativity and sheer talent it takes to pull off all the sometimes schizophrenic things he’s thinking, is awe-inspiring to many a burgeoning musician. But, truly sadly, as John Coltrane found out during his progressive period, the general public cares little about progressive chord changes, modulations, and split-second octave jumps. They care about memorable songs, and 1st Born Second was pregnant with easily understood, traditionally structured songs with unforgettable hooks to spare. The unreleased, heavily bootlegged Love for Sale took a more avant-garde view of song structure on several cuts, even deconstructing Radiohead’s “High and Dry” by the song’s vamp out. The nine-year follow-up to 1st Born Second, the funky rock of Airtight’s Revenge, tried to bridge the gap and included esoteric themes and heady subjects rarely discussed in pop music, from autism and mysticism to the effects of child sexual abuse and economic disparity, becoming one of Bilal’s most polarizing albums and a “love it or hate it” affair. His fourth round tackles a much more user-friendly subject, the life cycle of love, this time with the eOne/Purpose Music Group music label. Sonically, A Love Surreal is both rawer and muddier than anything previously released by Bilal, and the album is almost entirely written and produced by him (sans production contributions by Shafiq Husayn, Stevie Mckie, Conley “Tone” Whitfield, Corey Bernhard, Mike Severson, and Paris Strother of KING). The co-producers often double as musicians throughout the project, with frequent collaborator Robert Glasper guesting on the fragile “Butterfly.” Largely recorded with a live rhythm section in the studio, the project has an audible consistency and coherence from start to finish, with tonal changes between some songs so subtle they feel like movement shifts rather than entirely new songs. In keeping with the Black American Music (BAM) trend, the material is often jazz, funk, rock, hip hop, electronica and R&B all at once, with funk dominating the hot chicken grease feel of several “jam session” cuts and Bilal’s Rick James meets Prince vocal approach. As with most of Bilal’s catalog, you’ll have to listen closely for lyrical distinction given his penchant for sacrificing diction to groove and melody. Overall, the contemporary material lacks a timestamp, though Bilal owes serious thanks to the ‘70s funk and soul of the Isley Brothers' most rock-influenced years, especially on “A Stray” and “Never Be The Same.” That Bilal has created a rare work of art with A Love Surreal, is unquestionable; at its finest moments it is akin to Shuggie Otis’s debut in its potential for cult status among this generation’s aficionados. That said, commercially there are only a handful of songs that work for broad general consumption, and two have already been released with videos and one receiving airplay. “West Side Girl” and “Back To Love” are the least reflective of this album as a whole and are the most hip-hop influenced of the entire proceedings. Both solid releases are driven by bumping basslines and easy hooks, but lack the artist’s freedom in form. Arguably, neither are Bilal at his finest or truest, only at his most compromising. The public is a dangerous master and these songs seem created to appease their hunger for familiar urban sounds. Live, the artist has to work twice as hard within the songs’ straightjacket constraints to sell them in a set, which I witnessed at a performance at Chicago’s Shrine nightclub late last year. In addition to Glasper’s “Butterfly,” at least five other songs are indicative of Bilal, the ever-evolving musician, with an eye on art over commerce, though two could have had a life at radio back in the days when radio was worth a damn. The first missed opportunity for radio, “Slipping Away,” is an operatic tour de force of pain and frustration that anyone who has known loss can understand; when a wounded Bilal cries to the heavens in this torchy power ballad do not be surprised by your own tears. The second is the most traditional and yet still fresh adult contemporary slow jam on the project. “Never Be The Same” is the kind of feathery guitar ballad Philly International or Curtis Mayfield excelled in and is putty in Bilal’s skilled hands. Familiar electric guitar chords on “A Stray” support a blend of hard profanity with milky soft hooks. “A Stray” has all the live immediacy of a studio jam session you voyeuristically stumbled upon and then stuck around to hear what the band would do next. Loose and sinewy with plenty of astral elements, the three transitions of “The Core” could serve as an extension of last year’s KING collaboration with Robert Glasper with “Move Love.” Like much of progressive electrosoul, “The Core” isn’t so much a pop song as it is an extended interlude; but hey, it sounds good. The moshpit anthem, “The Flow,” is similar to “The Core” in its free-flowing sensibilities, but in the progressive rock meets electronica vein. Collectively, this six comprise the heart of A Love Surreal, and display a real range in voice, texture and artistry from a rare talent with a strong sense of music history. The remaining songs, largely classic rock in nature albeit with funk overtones, “Climbing,” “Long and Waiting,” “A Winning Hand” and “Lost for Now,” could all be holdovers from Airtight’s Revenge, which could be a good or bad thing depending on where you sat with that album. They are all open, polished productions and well performed, but not necessarily memorable independent of this set. Collectively, they contribute nicely to the project’s cohesion, but prevent the album from being a start to finish homerun in undeniable or infectious material. The marketplace concessions on A Love Surreal are few, and those looking for 1st Born Second will find nary a hair referencing a single song or sound from that beloved debut. And, for art’s sake, maybe that’s a good thing. Highly Recommended.